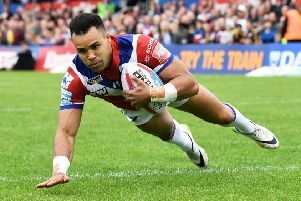 WAKEFIELD Trinity Wildcats chairman Michael Carter has apologised to fans after having to change two of the club’s home fixtures at short notice. The Super 8s game with Hull FC has been chosen for Sky Sports and, therefore, switched from Sunday, September 18 to Thursday, September 15 (kick-off 8pm). Subsequently, Wakefield have felt the need to bring forward next week’s home game with Catalans Dragons from Sunday, September 11 to Friday, September 9, (8pm). Carter said: “We, as a club, apologise for the late changes to the fixtures. “Like Castleford last week, we are completely in the hands of Sky for which games they want to show, and for player-welfare reasons, we now need to move the Catalans fixture from Sunday to Friday. Head coach Chris Chester, meanwhile, has made six changes to the squad that lost against Widnes Vikings last time out in readiness for Friday’s derby at Castleford Tigers. Tom Johnstone, Anthony Tupou, Scott Anderson and Mickael Simon all return after lengthy spells injured with Jordan Crowther also in. Ben Jones-Bishop, Mikey Sio, Jason Walton, David Fifita, Judah Mazive and James Batchelor drop out while Castleford have Jake Webster back in their ranks.